Hi Everyone! 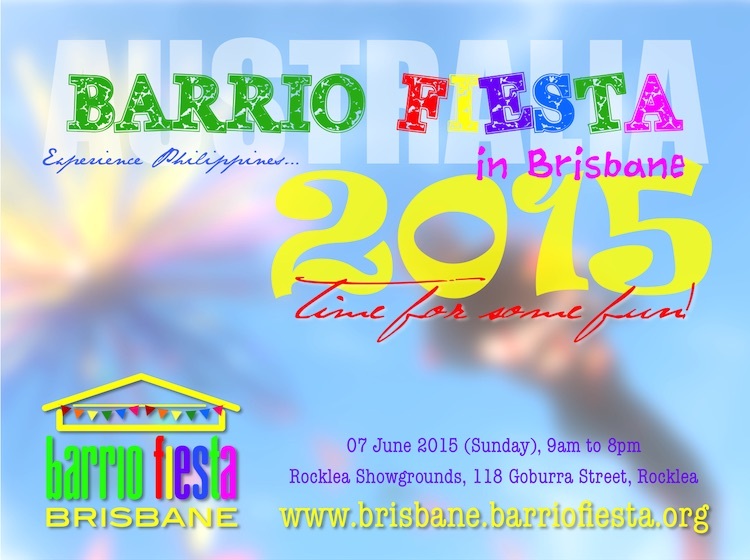 Guess what….the annual Barrio Fiesta in Brisbane will be on again this coming Sunday, 7th June 2015 and it will be massive. If last year was huge, this year would be way better…..kudos! to the people who are behind it. Since Federation of Filipino Communities in Queensland Inc. (FedFilQ) took charge, this annual event just keeps on getting better every year plus the new blood injected by the Filipino Students and volunteers with their beautiful performances and wonderful inputs. Lots of food and entertainment throughout the day! TSIBOG CAFE will once again be participating in this event and will be offering delicious and mouth watering Filipino Food. 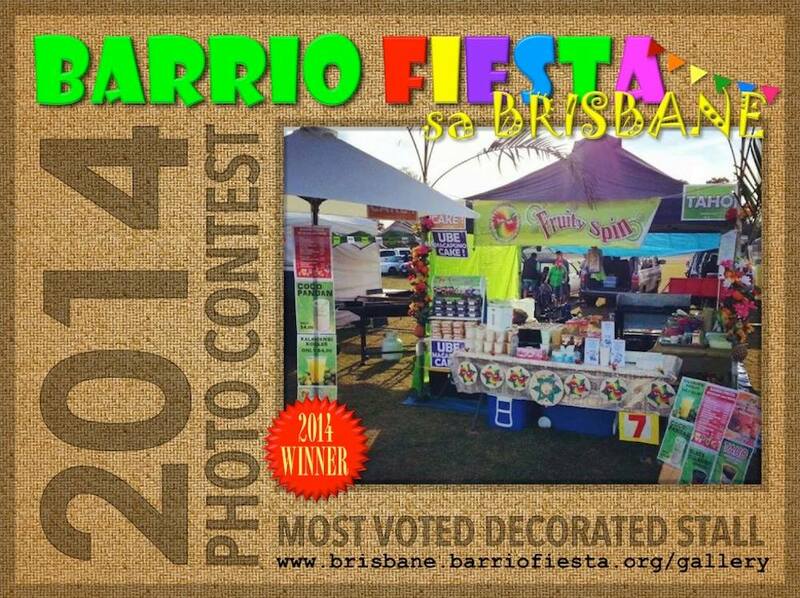 The TRIBE will be giving away freebies with food purchases….so you better be early! Remember it starts at 9am till 8pm…..
We got Pancit Malabon, Pork Bbq Sticks, Dinuguan, Ilocos Empanada, Mini Puto, Bibingka Cassava & Yema as our regular menu list with the newest addition of Adobo Pork Belly Siopao Burgers and freshly cooked Chicharon (Pork Crackling)…. I tell you now, better check out our stall first as our food goes fast! 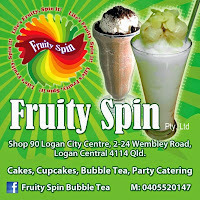 And also, don’t forget to visit our food buddy, Fruity Spin who sells thirst quenching treats, including Taho and their version of Halo-Halo drink plus their delectable slices of cakes. SEE YOU ALL THERE !!!!! These Choc Chip Cookies are a favourite in our TRIBE’s household, I’ve been making this for years now. Easy to make and bake, can be frozen and thawed for future emergency cookie craving baking episodes. Crispy outside, chewy inside…what more can you ask for? So, no further delay…..here’s my fool proof recipe for Choc Chip Cookies. ~ In your mixing bowl, combine white & brown sugars, butter, eggs and vanilla extract. Beat the mixture with your mixer for 30 seconds, then stop and scrape the side and beat it for additional 30 seconds. ~ In a clean dry bowl, place the baking soda, salt (optional) and flour together. Using the slow speed in your electric mixer, gradually add the dry ingredients to your wet mixture. Mix the mixture together for about 2 minutes then turn your speed a bit faster and add an additional 30 seconds. Remember to stop and scrape the sides to evenly mix the mixture well during this process. ~ Add in your chocolate chips and mix it in slow speed till all the chips are well incorporated with the cookie dough, set aside. ~ Lined your cookie tray with baking paper. ~ Portion the cookie dough into round balls (1 tbspn each), while placing on top of your baking paper, slightly flatten the bases (but not too much to avoid) the cookie dough balls from rolling around the tray. Evenly space the cookie dough balls about 5 cm apart for spreading. Bake for 10-12 minutes, the cookies will flatten itself while being baked so no need to flatten it with a fork or the palm of your hand. ~ Once the baking is done, please remove the baking tray from the oven and place the cookies immediately on top of your cooling wire rack. What I do is just slide the cookies including the baking paper and once the cookies are a little bit firm, that’s when I slide out the baking paper and use it again for another batch. ~ Cookies will be soft when it comes out of the oven as they cool down, they will become crispy outside and chewy inside. ~ Store in a tightly sealed container once all the cookies are completely cooled down, best eaten within a week if it last that long….in our house give it 2-3 days. You can freeze portioned uncooked cookie dough balls for future use. Just store the dough balls in a tightly sealed container/zip lock. Before baking, just place the dough balls into your baking tray as instructed and let it thaw first for around 15 minutes. If the weather is too hot, place your dough mixture inside your fridge till it becomes firm like play dough texture before rolling it into your cookie dough balls. Welcome 2015 …. the Busog! Sarap! way…. Time flies so fast… January 2015 is about to end in a few days. I do wish, I got the same power as the guys in Matrix that I can hold time still and do my mommy duties, that would be fantastic ! But sadly I got no such said powers, so here I am typing away to write my first entry for 2015 while my washing is drying out in the sun. Our New Year Media Noche was a simple spread with some ready made extras. In previous years, Mr H and myself tend to overkill ourselves from preparation but this New Year’s Eve was different as we learned to relax and unwind before midnight came. Such a great idea as an appetizer/snack for kids while they wait for the New Year’s midnight snack. I was going to buy some gourmet dips but went for these dips as the kids likes the taste. The Baked Stuffed Prawns were topped with a tomato/pineapple mixture with melted cheese, Mr H specialty…. they were really scrumptious! Mr H tried a couple of the prawns we bought with a new marinade and visualized it skewered…. the result was pretty good with a Mediterranean take. I’ve have prepared this Lumpiang Sariwa (Filipino Fresh Spring Rolls) earlier that day and just kept the container inside the fridge till it was ready to be served. Filling was composed of mixed sliced vegetables with pork mince. From all the Crispy Pata I have cooked, this batch was far the best I’ve deep fried. The outer skin was crispy and the meat inside still retained its moisture. We only grilled a couple of Pork Bbq Sticks for our New Year’s midnight snack for the kids. TRIBE’s Buko Salad are served in individual containers to be consumed in one go. I find it more hygienic and you only defrost what you need. While buying some Magnolia Ice Cream Tubs from an Asian Supermarket near our suburb, I saw this frozen Banana Turon in their freezer. Curiosity got the better of me and I bought a packet… so happy I only bought one packet as I will not buy this stuff ever again. When you cook them even when the oil was not too hot this Banana Turon burns in some parts. It does not look appetizing and the taste was only passable. It is the tradition among Filipinos to greet New Year with an array of round fruits…. it should be 13 pieces of different round fruits as a sign of luck and prosperity. For the people who are not aware, Philippines is a melting pot of cultures that we carry on some of the traditions other countries have and one of them is Chinese. Chinese sees the number 13 in their culture as a lucky number and the round fruits symbolizes coins which represents wealth…. who would want to argue with that, bring on the round fruits! Personally, I just tend to grab whatever fruits the TRIBE will eat as long as most of them are round, I tend to bend the rules a little bit…. lol! I saw these two items while shopping in one of my favourite Asian store the day before and I have to buy them. The Fortune Cookies taste like Egg Roll Biscuits and the Corn Tubes taste like Cheez Curls with corn flavour. They were wrapped in yellow and gold foil individual packets, that they reminded me of gold nuggets….. so for luck and prosperity I’ve included them in our TRIBE’s New Year spread. Now that I have edited and layout the New Year 2015 food pictures for this post, one thing I’ve noticed most of the food we cooked was “pulutan” (dishes for drinking session)…. *wink *wink *wink, hehehehe! Overall the spread we shared to celebrate the New Year was good, not to heavy for a midnight snack. We’ll be doing this kind of New Year food spread while the kids are still young, it’s easier and practical. Apology for the lateness of this post as you know SAHM duties are unpredictable and never ending. So, for now…. all I want to say to you all, may we all have a fantabulous 2015!